Port-wine stains, also called capillary malformations, are birthmarks that usually appear at birth and can persist throughout life. The most common location for these birthmarks are on the face, but they can appear anywhere on the body. As the patient ages, an untreated port-wine stain tends to become darker in color and can even thicken in adulthood. The doctors at Physicians Laser and Dermatology Institute helped develop many of the laser systems used today to treat these birthmarks. Below are some commonly asked questions about laser treatment for port-wine stains. What can I expect after my laser treatment? Depending on the laser system used, one can expect different post-procedure changes. If the traditional pulsed-dye laser system is used, the treated areas will appear dark purple or black immediately following the laser treatment. This darkening may remain for 5-14 days after treatment. The area around the treatment site can become red and itchy for a few days. 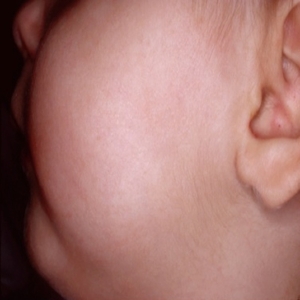 If the upper cheek or eye are treated, there can be some swelling as well. Some of the newer light systems can be used effectively on port-wine stains, such as the intense pulsed light systems. These do not cause the same darkening, but instead may cause the birthmark to appear redder for a few days. Your dermatologist will discuss with you as to which laser system is best for your individual case. May I have sun exposure following my laser procedure? Direct sunlight before or after the laser treatment increases your risk of potential side effects from the procedure and will decrease the effectiveness of the laser. Any tan on the skin “blocks” the laser light from reaching the blood vessels of the port-wine stain, and additionally can increase your risk of temporary or permanent lightening of the background skin. Strict photo-protection of your birthmark with a sunscreen of at least SPF 30 and re-application every 2-3 hours is a necessity. How often can I have my birthmark treated? Port-wine stains can be treated every 4 weeks in very young children. In older children and adults, we typically wait 8-12 weeks to treat again. Every patient and every birthmark is different. The earlier a birthmark is treated, the better the chance of achieving clearance. 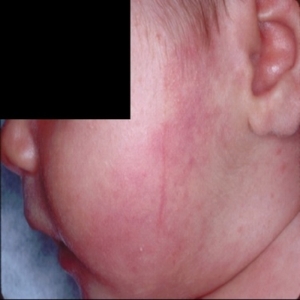 Most patients will see lightening of their birthmark and a small percentage may become clear. It is not possible to predict how someone will respond to laser treatment.